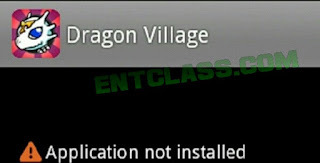 Have you tried to install an app on your Android device and got an error saying "Application not installed"? Ofcourse it's a common problem we Android users face. Sometimes, it requires us to turn on "Unknown source" which can be found in your phone Settings>Security. But atimes, no matter how you try, the app might prove stubborn to install. In this article, we shall look into the possible causes of this issue as well as the possible solution to them all. Kindly read on. >> Insufficient storage space: Your storage space may have filled up with no more space to accept new apps. >> Corrupted app or apk file: This is most common with apps downloaded from outside Google Play Store. The app is either corrupted or incompletely downloaded or copied as the case maybe. >> Incorrect app install location: Some apps are meant to be only installed on phone memory while some others can be installed on both phone memory and SD card. Trying do otherwise with the former can bring up this errors. >> Installation on a mounted SD card: Maybe, your SD card is mounted on a laptop or elsewhere. Trying to install anything in this state will result in errors because the SD card is inaccessible. >> Corrupted storage (Phone and SD card): This is probably the most common cause of this error. If the storage of your device is corrupted, any app installation will be impossible. >> Apk signature/certificate clash: Installing another version of an app (with a different signed certificate) on the same device will probably result in this error. Installing an unsigned app could also result in this error. >> Reboot the phone: In times like this, first thing to do is to reboot your device. Or just shut down, remove and reinsert your battery if it's a removable battery. >> Make sure to uninstall any apps you don’t use to free up space, also uninstall previous versions of the same app currently installed on your device. >> Double check the apk files you download and be sure they were completely copied or downloaded. >> Try resetting app permissions by going to Settings >Apps>All>Menu key >Reset application permissions or Reset app preferences. >> Change app installation location to Automatic or Let system decide. >> For worst case scenarios, format your SD card – copy it’s contents somewhere else for backup and format. >> The last solution would be to totally wipe your device. Either by doing a factory reset under Settings or by doing a full wipe in recovery mode. To truly confirm the issue is resolved, try installing any app and give me feedback in the comment box below. Good, thanks for sharing this vital information with us. Many android users faced these problems, thanks for sharing this.